Laminate Flooring is the one of the hottest flooring products being sold today. For homeowners who want a floor that is meant for active lifestyles, is easy to keep clean, and is fairly inexpensive, a laminate floor may be the perfect solution. 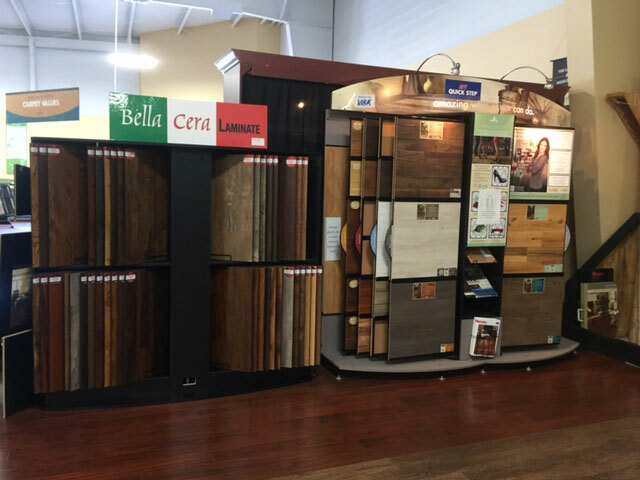 With our wide selection of laminate flooring we can match almost any decor - from formal, to traditional, to country, or to contemporary we have the floors that will bring your room alive! We carry Quick-Step and Mohawk laminate flooring and we offer professional installation with a full installation guarantee. Carpet Values is your Louisville Area Laminate Floor Store! Laminate floors are a combination of special resins (melamine), a print film and paper layer, a fiber core in the middle, and a resin filled backer sheet that are all fused together into one solid piece. Although they appear similar to a Formica countertop, they are really much more durable and scratch resistant. Due to it's construction and components, laminate flooring will not stain, fade from sunlight, and the finish is extremely impact resistant. These floors have precision tongue and groove edges for securing the planks together, and they can be installed over most types of subfloors. Most of the laminate flooring brands carry a 15 to 25 year warranty against staining, fading, and wearing through the finish to the print layer. Recently, some of the manufacturers have also added a Water Damage Warranty, which protects you if you use these floors in a kitchen or bathroom and have an accident. Like all flooring we recommend regular maintenance to get years out of your flooring investment. One of the really exciting things with laminate flooring is that several manufacturers have been able to recreate some of the old historical hardwood flooring styles, like rough sawn barn oak, American chestnut, knotty pine, and several others. These floors can really add to the charm and feel of a room, without breaking your pocket book. Have a question? Our expert team is happy to help you!